Bridgestone Golf Tour Premium Glove (Right Handed Golfer- Left Hand) - $17.95 - GolfersEdgeOnline.com - Best Golf Equipment On The Web! Premium cabretta leather provides exceptionally soft feel and a terry cloth wrist band delivers ultimate comfort. 5 color changing tabs provide maximum versatility in style. This glove model is played across Tours world-wide including by Matt Kuchar and Davis Love III. 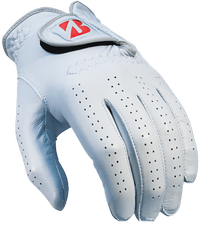 Bridgestone's Softest and Thinnest glove ever! If you have any more questions about the Bridgestone Golf Tour Premium Glove (Right Handed Golfer- Left Hand); do not see the model you are looking for; need custom options; or prefer to not purchase online, then please call us at (630) 656-1291.